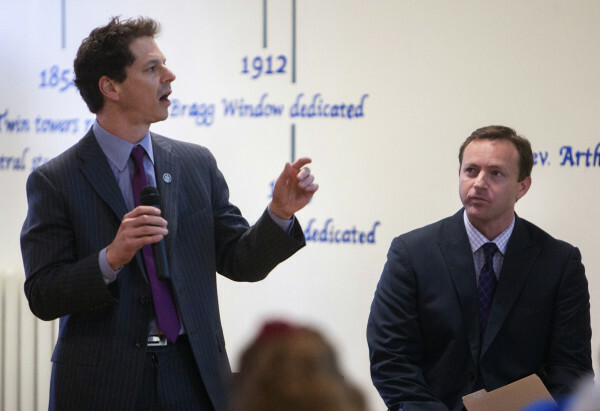 Sen. Justin Alfond (left) and Speaker of the House Mark Eves give a presentation on the Democrats' budget proposal during a town hall meeting at the Hammond Street Congregational Church in Bangor on April 22. In my last column, an analysis of Gov. Paul LePage’s tax plan revealed that his claimed $292 million tax cut was really only a $2 million net tax cut. It increased taxes on the bottom 90 percent by $51 million and decreased taxes for the top 10 percent by $53 million. Since then, the Democrats have come out with their “Better Deal For Maine” plan. It is true that the Democrats’ plan is a better deal than the governor’s plan for most Mainers, but it is still a bad plan. The Democrats’ plan is better because it eliminates the $37-million estate tax cut for millionaires, many of whom are non-residents. It eliminates the unnecessary $40 million corporate tax cut, the vast majority of which goes to multi-national corporations like Walmart. It eliminates the governor’s proposed cut to the top income tax rate, which benefits only very high income taxpayers. It also eliminates the increase in the pension income exclusion, which benefits only a small group of Mainers and is an inequitable tax policy, which favors pensions over wages. But the Democrats’ tax plan contains several provisions that are adverse to middle-class taxpayers in Maine. 1. It increases the regressive general sales tax rate from 5 percent to 5.5 percent and expands the sales tax to professional and other services. 2. It offsets some of the sales tax increases by adopting the governor’s sales tax credit. The problem with the sales tax credit is that it phases out at too low of an income level, and it requires many low income taxpayers who don’t file income tax returns to file tax returns to get the refundable credit. The much easier solution would be to keep the sales tax rate at 5 percent and not expand the sales tax to new services. Then the sales tax credit can be eliminated. The expansion of sales tax to services is based on two myths, one that it will be exported to non-residents and that most states tax these services. The fact is very little if any of the proposed services like accounting, legal and many personal services will be exported, as tourists do not purchase these services while visiting Maine. In addition, if Maine were to adopt the proposed expansion to tax these services, it would be one of only five states that tax most of these services. With regard to the expansion of the sales tax to amusements, this change does make sense as 32 states currently tax all or most amusements, and the sales tax on Maine amusements is partially exportable. The Democratic plan lowers the current 6.5 percent individual income tax rate to 6 percent and creates a new 7.5 percent tax rate and increases the income level at which the 7.95 percent rate begins. These changes are good, but they make up for the lost revenue by eliminating itemized deductions and phasing out a new standard deduction for single taxpayers with income over $50,000 and married taxpayers with income over $100,000. The result is that a single taxpayer with income from $50,000 to $75,000 and married taxpayers with income from $100,000 to $150,000 pay taxes at a marginal rate of 10.2 percent. Many middle-income taxpayers who itemize deductions will have a net tax increase over current law. The governor’s tax plan, which also eliminates itemized deductions, will have the same problem. The elimination of itemized deductions should be rejected as it creates a net tax increase for many middle-class taxpayers. The Democrats’ tax plan also increases the meals tax rate from 7 to 8 percent, which is high when compared with other states. Because the majority of meal taxes are paid by Mainers, increasing the meals tax should be rejected. Rather, the lodging tax, which is scheduled to go back to 7 percent, should be increased to 9 percent, which is paid mostly by non-residents, and the 9 percent is more in line with other states. The Democrats’ tax plan also adopts the governor’s new property tax fairness credit, which has been incorrectly estimated at $90 million. The actual number will be closer to $40 million based on the just-issued Maine Revenue Services numbers for the 2014 credit of only $16.5 million. The property tax circuit breaker program, which was significantly better than the new tax fairness credit should be reinstated at a cost of about $60 million (or $30 million less than the budgeted property tax fairness credit). The governor’s tax plan eliminates all revenue sharing, and the Democrat’s tax plan restores about half of the revenue sharing. The Democrat’s tax plan also increases the homestead exemption from $10,000 to $20,000 for all residents. While these changes will be popular with the voting public, paying for these with sales tax increases is a net loss for most Mainers. Both Democrats and Republicans refuse to understand the math that the sales tax is more regressive than property tax, and more property and income tax is “exported” to non-residents than sales taxes. Accordingly, the homestead exemption should remain at $10,000, and the revenue sharing should be maintained at the 2015 budget level of about 2 percent of state sales and income tax revenues. By year 2019, the Democrats’ tax plan creates a net tax revenue increase of about $100 million and increases net taxes for Maine residents by about $56 million. The bottom 90 percent would have a net tax decrease of about $45 million, and the top 10 percent would have a net tax increase of about $101 million. Making my suggested changes to the Democrat’s plan would turn the $56 million tax increase into a $46 million tax cut for Maine residents. But I doubt any of my suggestions will be enacted, and any compromise coming out of Augusta will probably result in a net tax increase to Mainers. Albert A. DiMillo Jr. of South Portland is a retired corporate tax director and CPA with more than 30 years of tax experience. He can be reached at aadimillo@yahoo.com.